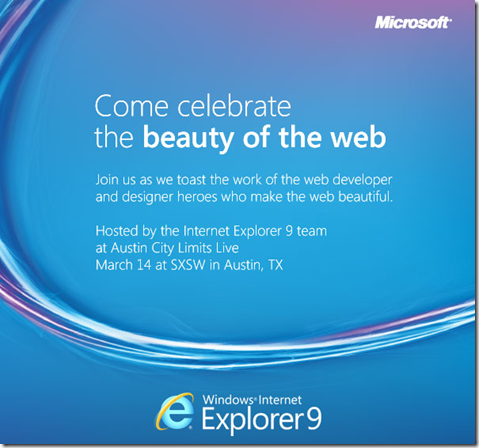 After Internet Explorer 9 Release Candidate event at San Francisco, Microsoft IE 9 team is getting ready to celebrate “Beauty of the Web” party with developers and designer at SXSW on March 14 said in a blog post by Ryan Gavin Senior Director, Internet Explorer Business and Marketing. Though the main motto of the event is to celebrate and acknowledge developers and designers who are making beautiful web a reality but as per the Neowin sources, the event will notice some big announcements from Microsoft directly related to Internet Explorer 9 & it could be Internet Explorer 9 final announcement or release. Only time will tell what Microsoft Internet Explorer 9 team has to offer.